The New York Giants waived/injured offensive lineman Jessamen Dunker on Wednesday with an undisclosed injury. To fill that vacant roster spot, the team signed rookie offensive lineman Corin Brooks (University of Texas – Permian Basin). Dunker was signed by the Giants as an undrafted rookie free agent after the 2017 NFL Draft. Brooks is an athletic but raw, small-school prospect who lacks ideal size. He is versatile, having played both tackle and guard. Brooks was signed by the Kansas City Chiefs after the 2017 NFL Draft but waived in June. Wide receiver Tavarres King (ankle), wide receiver Kevin Snead (lower body), defensive tackle Robert Thomas (“sore”), linebacker Keenan Robinson (concussion protocol), linebacker Mark Herzlich (stinger), cornerback Mykkele Thompson (quad), and safety Ryan Murphy (lower body) did not practice. Beautiful day, 80-plus and sunny with a slight breeze. Two days before a game, the intensity was slightly down but I thought for the most part they were still competing. No pads, but they were in shells. Small note about the layout of practice and this team’s approach to Special Teams…a TON of time is spent on this phase. Gidie made a note that the Coughlin era did not spend nearly this amount of time on specials and that McAdoo appears to run a much more organized, regimented practice. It is a very smooth process from start to finish. K Aldrick Rosas has such a powerful leg. There is a trend in the league right now with kickers. They are MUCH better athletes than I remember watching growing up. Rosas fits the mold, he definitely spends time in the weight room and the trajectory of his kicks shows. He has the inside track for the number one job as long as he doesn’t mightily struggle in preseason games. The talk of the day from the “story” side of things will be Chad Wheeler and his short stint with the number ones. I don’t think there is any speculation deserved on him being in an under-the-radar competition for the starting LT spot. He has been impressive, which we have noted a few times, but no way is this team giving up on Ereck Flowers yet. Wheeler was beat badly by Olivier Vernon on his first play, and may have gotten away with a hold on the next. However this is important for his maturation process, to see what a top half of the league DE actually plays like. He is one of my focal points for Friday night, something he is really pumped about. The newly signed OL Corin Brooks looks like a guard, that is my first impression based on just checking him out and going through individuals. I don’t think he got on the field with the offense today. WR Sterling Shepard looks to be getting better each day, he faced off in some one-on-one drills. He made a nice body-adjusting catch where again, he seemed to have zero hesitation on his ankle. WRs Darius Powe and Roger Lewis are competing for a spot. There is a chance both will make the roster but I think it’s slim. Powe offers more size and strength and I think more reliable hands. Lewis is the better, looser-hipped athlete who will make the big-play that raises eyebrows. He has also been good for an obvious drop pretty much every day and appears to be misreading defenses on his option routes. If it comes down to special teams, Lewis will win out. TE Evan Engram lined up split out wide against LB Jonathan Casillas one play in 11-on-11. He didn’t get the ball thrown his way but it was a very simple 4-5 steps before he was running deep leaving Casillas in his rear-view mirror. If this kid can get match-ups like that in space…. TE Matt LaCosse with ANOTHER impressive catch. No, you aren’t reading yesterday’s report, or the one before that, or the one before that. This kid is getting it done every day. I hope he gets some first-team looks in games over the next few weeks. While we are discussing backup TEs, I am still waiting on Colin Thompson’s first drop because it hasn’t happened yet. The offense had a bit of a sloppy day. Eli Manning didn’t see DE Olivier Vernon on a zone blitz as he dropped in to coverage, throwing a near INT on a 5-yard pass. Weston Richburg sailed a snap over Manning’s head soon after, and Paul Perkins dropped an easy pass in the flat later on. RB Wayne Gallman isn’t getting a ton of reps, but he showed a jump cut today that most backs can’t do. LeSean McCoy is the master of the jump cut if you need a visual, and Gallman caught a ball while twisting in the air, landed, and jump-cut his way to a TD. Not sure many people even noticed it but again, most backs can’t move like that. RB Khalid Abdullah’s main weakness is unplanned movement. He looks strong and explosive when he is running straight ahead without adjustment. But when he has to innovate on his own, react to a defender, or turn his body to get a pass away from his body he looks very unnatural. Soon after I spoke about not knowing or understanding if LB Stansly Maponga can fit in this scheme, he goes out and has a day. He showed a strong pass rush presence against OT Adam Bisnowaty. He gets his pad level really far down and his weight plus lower body strength makes him hard to alter. He may get caught in the number’s game but he does have versatility on his side. DT Damon Harrison seemed to uptick a bit today despite not being in full pads. I will stand by my statement I made a few weeks ago. He is the most important player on this defense. If he stays healthy, he alone will keep this run defense competitive. And I hate to sound like I am wearing blue-colored glasses, but I strongly believe this defense can be the best in the league. There are stars and potential stars everywhere. Seeing Harrison eat double teams with ease, then watching the DEs Jason Pierre-Paul and Olivier Vernon rush the edge, with arguably the best top three CB combo in the league and a budding star in Landon Collins…I think NYG fans need to soak this up. This might be the best defense in a long time that this team has had. Two LBs at the bottom of the depth chart looking up are Deontae Skinner and Curtis Grant. Both are straight-line guys with stiffness when moving laterally. In addition, I don’t see the quick, easy reactions to the offense right after the snap. They are a step behind. The contrast between them and a guy like B.J. Goodson when it comes to instincts is blatantly obvious. DE Olivier Vernon looks great, albeit against tackles that may be a step below what he will face most Sundays. What I like about him, and something I always look for in pass rushers during the scouting process, is his ability to stay low, balanced, powerful, and quick. He values run defense as we saw last year and I predict we will see more sacks than what he put out in 2016. They have him standing up on some plays, something I think he prefers. Did S Duke Ihenacho move up on the depth chart over Andrew Adams? Looked like he was 2nd-string guy today. I don’t have much on him but he does have more experience than every safety on this roster and a lot of coaches around the league like a guy back there like that. CB Donte Deayon: I can tell Spags really likes this kid both from how he treats him in practice and what he says about him to the media. There are guys that some coaches quietly root for, and Deayon is one of them. He plays all out, all the time. He follows his assignments. He plays with a chip on his shoulder. He is rarely out of position. That sounds good for a 5th/6th corner. His size limits him in a lot of areas but there isn’t a guy on this team that can stick to Odell Beckham the way Deayon has showed. QB Eli Manning: It’s time we talk about him a tad. He has become so reliable and consistent year to year that NYG fans likely take him for granted. McAdoo said this has been Manning’s best camp when it comes to understanding the offense and it’s intentions, completing passes, and teaching others. I think it is fair to suggest this may be his best year yet. It was nice to see Manning walk off the field with TE Evan Engram after 11-on-11 talking about what to do when he starts checking down/scrambling. That relationship will be HUGE for this offense. TE Rhett Ellison: When Ellison was drafted by MIN, the primary focus was him blocking and aiding the Adrian Peterson show. He never quite got to expose himself as a receiver consistently. Knowing how much Manning uses the TE in any scheme he’s in and how reliable Ellison looks like as a route runner and pass catcher, I think he may be THE safety blanket that Manning could have used last year. WR Sterling Shepard adjusted well to a deep ball from QB Eli Manning against CB Valentino Blake. PK Aldrick Rosas was 3-for-4 on field goal attempts. QB Eli Manning threw a slant pass to WR Sterling Shepard in front of CB Dominique Rodgers-Cromartie. Then WR Odell Beckham, Jr. wrestled away a Manning pass over the middle from CB Donte Deayon. CB Michael Hunter defended a QB Josh Johnson pass intended for WR Dwayne Harris. QB Geno Smith threw a touchdown pass to WR Keeon Johnson. FS Darian Thompson made a diving pass break-up of a long pass from QB Eli Manning to TE Evan Engram. WR Roger Lewis made a diving, toe-dragging reception of a pass from QB Eli Manning for a touchdown. But then Lewis dropped a pass from Manning before making a leaping catch down field from QB Josh Johnson. S Landon Collins broke up a QB Eli Manning pass coming on a blitz. WR Travis Rudolph beat CB Valentino Blake on an out route. Chad Wheeler received a few first-team snaps at left tackle, but was beaten badly by DE Olivier Vernon on his first snap. QB Josh Johnson hit WR Roger Lewis for a touchdown against CB Valentino Blake. QB Davis Webb participated in his first 11-on-11 drills of the summer. He threw a strike to WR Kevin Norwood on the right sideline, but struggled to move the ball after that. There is no media availability to the team on Thursday. The Giants play a home preseason game against the Pittsburgh Steelers on Friday. The twelfth and second-to-last public training camp practice will be held on Sunday, starting at 11:10AM. The training camp schedule is available at Giants.com. The New York Giants held their eighth summer training camp practice on Saturday at Quest Diagnostics Training Center in East Rutherford, New Jersey. Wide receiver Sterling Shepard (ankle), wide receiver Tavarres King (ankle), and linebacker Keenan Robinson (concussion protocol) did not practice. Shepard did warm up before practice and did some light running. Practice was closed to the public today. Overcast skies, minimal wind, very comfortable temperature. Mike Nugent showed better loft and distance on kickoffs than Aldrick Rosas. Who knows if they were actually trying to let loose or not. A lot, and I mean a lot, of attention is put on special teams. We got to see plenty of 1-on-1 battles with these guys going all out on each other. They were practicing blocking on the move, where the offensive player runs to a spot, turns around and goes head to head with a downhill defender that had a 15-20 yard head of steam. The bubble guys need to show something here. DE Kerry Wynn was beating everyone he matched up against. S Trey Robinson stood out a couple times. S Landon Collins got involved twice and even in a simple drill like this, his ability stands out. RB Wayne Gallman’s lack of presence showed, he may have a hard time factoring as a blocker at his size. LB Calvin Munson stood out, consistently getting rave reviews from coaches. As I left the practice facility, QB Davis Webb was working on deep throws and footwork associated with them with two of the Giants support staff (ball boys). This was a solid 20 minutes after practice. TE Rhett Ellison was on another field working on his technique out of his stance, getting into his routes. One thing I see wide receivers Odell Beckham and Brandon Marshall do very well is that they attack the ball in the air. They don’t sit back and let it come to them; they alter their weight and attack. Very important that your top guys do that. Marshall overwhelmed CB Valentino Blake on a pass near the back of the end zone; there was no chance for Blake – he looked like a kid trying to defend his dad and that is not a knock on Blake. TE is a very crowded group. Colin Thompson keeps jumping out at me. I think there is no shot he makes the team, but he is a legit practice squad candidate. The team brought him in as a blocker, but he moves much better when running routes than I initially thought. Soft hands, been catching almost everything thrown his way. This TE group in camp is very solid. I put more attention on the two rookie OTs, Adam Bisnowaty and Chad Wheeler. Wheeler does a great job post-snap. He gets out of his stance quickly and easily. Very good body positioning, knee bend, and set up. Honestly, he is better than Ereck Flowers when it comes to that part of the process. Bisnowaty is a little more sluggish and unsure. He didn’t keep his feet moving against Kerry Wynn today and it made him look silly. He was facing the ground on a couple of occasions, showing he is over-committing and lunging while bending at the waist. Body wise, Wheeler simply needs more muscle as I have been saying. Bisnowaty too, but you can tell he has spent more time in the weight room. OT Ereck Flowers had a solid day but his over-lean and wrap-around the defender’s neck in pass protection flared up twice from what I saw. OT Bobby Hart was schooled by DE Pierre-Paul again, winding up on the ground. OG John Jerry, when I had the vantage point to really zero in on him, didn’t get beat at all. He is a very large man with athletic legs. He is without a doubt the starting RG over D.J. Fluker. Geno Smith vs. Josh Johnson battle goes to Geno today. He is looking more and more confident with each day that passes. His arm is much more lively than Johnson’s. TE Matt LaCosse with another nice TD catch today. Natural hands on the move with a huge wingspan, nice weapon to have especially in that area. WR Kevin Snead body catches everything. Amazing to see the difference between him and Beckham and how they approach catching the ball. RB Orleans Darkwa’s avenue to making this team is likely the short-yardage back. He is bigger and stronger than the other guys. Without Darkwa, there really isn’t any sense of power in that backfield. If the team doesn’t think he can handle that job, I wonder if the 4th RB is even currently on this roster. WR Roger Lewis doesn’t get a ton of WR reps with the first or second group. I’m wondering if he is actually that far down the depth chart or they are just trying to get the bubble guys more reps to fully evaluate. He did drop an easy TD on a short slant pass and his routes aren’t crisp. But I really like how Lewis moves. Very twitchy, loose, and strong. I think he has the potential to be a top tier gunner in this league on special teams. WRs Darius Powe and Travis Rudolph might be competing for one spot. We have highlighted Rudolph already, his ability to do everything right stands out. But he doesn’t separate downfield at all and he isn’t physical enough in traffic to be a factor. Powe has the size but I’m not sure he can separate from NFL DBs. He doesn’t have long speed and there isn’t a lot of quick-twitch to him underneath. The team’s #4 CB has to be Michael Hunter. I’m saying this right now with a lot of confidence, there are teams in this league where he could start. He is so consistent when it comes to trusting his footwork and length while attacking the ball. He is breaking up multiple passes every day. NYG has an outstanding CB group, maybe the best in the league if Eli Apple takes the expected step up. CB Janoris Jenkins ignores size completely. He shows no hesitation when going after WR Brandon Marshall. He is so fast to diagnose and react. He sniffs out screens and crossing routes in a blink. And I love how hard he competes for the ball in the air. DT Jay Bromley made a couple nice plays against the run today. He beat D.J. Fluker badly on one running play which would have resulted in a 4-yard loss. He is a very large, long guy. There are tools to work with there, it will just be a matter of him showing consistency when it comes to technique and awareness. The question with the DT group will be how long guys can go before needing a break. Damon Harrison started to break down a little towards the end of last year, Robert Thomas was limping around between plays today with what appeared hamstring/back soreness (just speculating). Dalvin Tomlinson looks like he is still trying to figure it out mentally, as he hasn’t been able to get off blocks at all. Jay Bromley is very inconsistent as I noted. I put the eye on FS Darian Thompson today as best I could. Not sure how these guys are coached, so take it with a grain of salt. But he was very good at keeping track of receivers in his area. Keeps his head on a swivel and won’t get fooled by the QB. His lower body moves very fluidly. I haven’t seen him tested deep though. The one concern I have is that these DBs don’t get a lot of work defending deep passes. In live action, the team’s offense almost never throws the ball downfield more than 20-25 yards. A guy like Thompson needs to work on that part of his game, as does CB Eli Apple, and it’s not happening much if at all in practice. DE Kerry Wynn had a very good day. He made an impact on 1-on-1 special team drills and during live team drills from his DE spot. He is a guy that the coaches know they can depend on. I am leaning towards his making this 53 man roster. He is definitely ahead of DE Devin Taylor right now. DE Jason Pierre-Paul is dominating Giants OL during live drills and one-on-one’s – no matter who he is matched up against and no matter where he is lining up. Each day that passes, I am leaning more and more towards DE Owa Odighizuwa not being in the final picture. He did beat OT Jarron Jones a couple times, but other than that there is too much rigid lower body movement and a severe lack of reaction/quick twitch. Unfortunate but he just doesn’t seem to have it. TE Evan Engram: By far his best day of camp so far. We got to see a few special catches. With defenders draped all over him, twice he made a TD catch while barely sneaking in before the sideline/out-of-bounds line. He plays super-fast but under control. He keeps on catching everything and there isn’t a defender on this team that is built for covering him. He is exciting in this short-pass offense. S Eric Pinkins: This kid is certainly making a name for himself. Very impressive physically with his combination of size and speed. At 6’3/230 with zero bad weight, he brings a different level of physical prowess to the secondary. He can be a special teams demon which should get him on this 53-man roster, but I like him as a backup safety as well. There is a ton of upside here and if the team is patient, we may see something big. OG Jessamen Dunker: You know, this kid needs a year of weight room work from what I can see. He doesn’t quite fill his pants yet. But he plays strong. His lower body mechanics and athleticism are as good as any of the OL on this team. And he showed great hand placement and strength in one-on-ones. I want to say he is a lock for the practice squad but if he goes out and impressed in the games, I say there is a shot he is the last OL on the 53-man roster. He really is impressive. In 7-on-7 drills, quarterback Eli Manning threw a touchdown pass to wide receiver Odell Beckham, Jr. in the left corner of the end zone. Tight end Evan Engram made a diving touchdown catch from quarterback Eli Manning in the corner of the end zone. Manning later found Engram again for another touchdown in front of safety Darian Thompson. Engram caught three touchdowns during 7-on-7 drills. Cornerbacks Janoris Jenkins and Dominique Rodgers-Cromartie broke up passes intended for tight end Evan Engram and wide receiver Travis Rudolph, respectively. Jenkins later defended a slant pass from Manning to wide receiver Brandon Marshall. Quarterback Josh Johnson found wide receiver Kevin Snead in the back of the end zone for a touchdown. Safety Eric Pinkins intercepted a quarterback Josh Johnson pass intended for tight end Matt LaCosse. Quarterback Geno Smith threw a touchdown pass to tight end Matt LaCosse. Smith then hit tight end Jerell Smith down the right seam and wide receiver Darius Powe despite tight coverage. Linebacker B.J. Goodson broke up a short pass intended for running back Orleans Darkwa. Running back Paul Perkins fumbled during 11-on-11 drills after being hit by cornerback Janoris Jenkins. Running back Wayne Gallman had a pass deflected off of him that was intercepted by linebacker Mark Herzlich. Herzlich later broke up a pass intended for wide receiver Travis Rudolph. Cornerback Michael Hunter knocked down a pass on a crossing route. Cornerback Donte Deayon broke up a fade pass from quarterback Geno Smith to wide receiver Travis Rudolph. 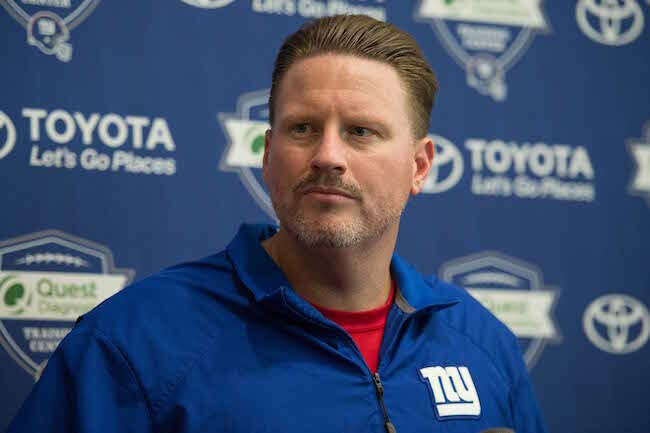 The transcript of Ben McAdoo’s press conference on Saturday is available in The Corner Forum while the video is available at Giants.com. The Giants are off on Sunday. The ninth training camp practice will be held on Monday, starting at 11:10AM. This practice is NOT open to the public. The training camp schedule is available at Giants.com. 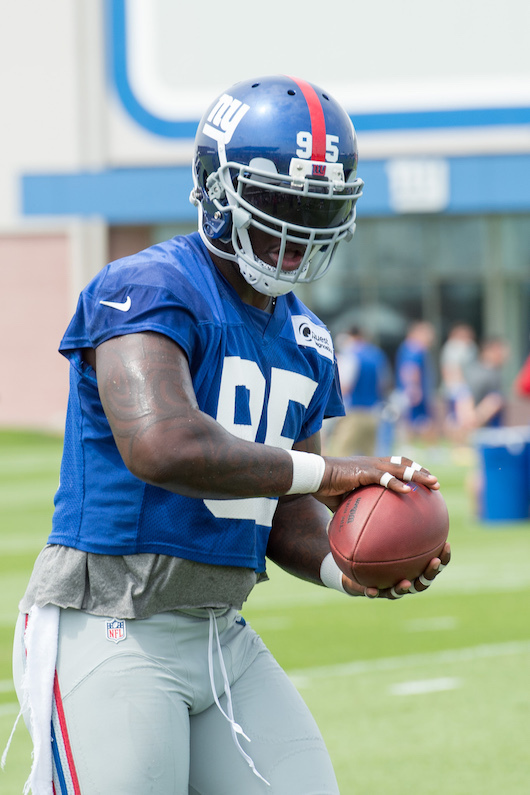 The New York Giants held their sixth summer training camp practice on Thursday at Quest Diagnostics Training Center in East Rutherford, New Jersey. Wide receiver Sterling Shepard (ankle), running back Shane Vereen (lower body soreness), offensive lineman Jessamen Dunker (foot), defensive end Devin Taylor (lower body soreness), linebacker Keenan Robinson (concussion protocol), and cornerback Valentino Blake (lower back tightness) did not practice. Wide receiver Tavarres King (ankle) and linebacker B.J. Goodson (left foot) left practice early. “(King) rolled his ankle covering a punt,” said McAdoo. Another picture-perfect, sunny day. Could be me but at the start of practice I thought the energy was a little down. Part of the dog days and with those pads on, the heat has to be intense. Soon after that thought, however, the fights began and it got pretty intense. Guys getting knocked down. Damon Harrison and Justin Pugh are the alpha males in those fights. They are the ones calling the shots and rarely does anyone even try to hold them back when they are involved with another player. K Aldrick Rosas very impressive today, hit a 56 yarder by a lot. He’s got the power, that’s for sure. The OL as a whole came out and competed today, much more than what we have seen to this point. Bobby Hart and Ereck Flowers did a nice job getting their hands inside. Hart was juked out of his shoes a couple times by Jason Pierre-Paul. The question with Hart has nothing to do with effort; he has it. However, the upside/talent gets exposed when a guy like JPP lines up across from him. I think his ceiling is pretty limited. Flowers showed off his immense upper body power on a few occasions today. OGs D.J. Fluker and John Jerry had a good day at the expense of DT Dalvin Tomlinson and veteran Robert Thomas. Excellent run blocking, good enough pass blocking. We know this already, but WR Odell Beckham, Jr. makes me say “wow” about 7 times a day. What he can do in terms of catching the ball with such ease and consistency in addition to his burst, speed, and agility is incredibly rare. Fun kid to watch and he practices hard. QB Davis Webb doesn’t get a ton of reps (if any) during the live 7-on-7/11-on-11 team drills, as this team needs to figure out the Josh Johnson vs. Geno Smith situation. He did get his own little 7-on-7 display at the end of practice. It’s not fair to really evaluate him yet as a physical player; there is so much being thrown at him. He shows the live arm, smooth release, and surprisingly very solid footwork. What I am more impressed by, he is incredibly active when he isn’t the QB that is up. Going through all the signals, helping the coaches get the right groups out there, running from drill to drill while others walk. Those are the little things that are important. He has really put his best foot forward. Nice to see a fade pass from QB Eli Manning to WR Brandon Marshall for a short TD. Eli has been missing the guy to throw that to for a long time now. The Manning/Marshall connection is there, it appears. RB Wayne Gallman is showing some impressive running techniques when moving through traffic. Low pad level, high feet with outstanding agility and burst. I had more of a straight line-mover type view on him coming from Clemson, but he can shake and move laterally better than I thought. WR Kevin Snead got less special team looks today after his nightmare on Tuesday, but he did catch the longest pass of the day from Josh Johnson for a TD. He burned CB Nigel Tribune and S Duke Ihenacho. On the flip side, he was mangled at the line of scrimmage by Tribune earlier. He is a space-only threat right now. TE Will Tye looks quicker than he was last year. Did he lose some weight? Did he work on foot speed? Is he simply more confident in the scheme? Not sure. But he gets in to his routes fast and his head around even faster. He had a nice day catching the ball. TE Matt LaCosse continues to make his argument for making the team among a crowded group. He has shown he can catch the ball on the move, but today he made some physical catches with defenders draped all over him. Catching the ball in traffic like that is very important for a guy like him. His presence as a blocker is less than ideal, but his effort is always there. CB Dominique Rodgers-Cromartie is lining up all over the place. I like the versatility he brings to the table. Such a smooth backpedal and burst out of it. He has a nice feel for what the offense is trying to do, a great weapon to have considering how much they have him roaming. CB Michael Hunter another impressive day. His size and speed in combination with the quick-twitch reactions has to be bumping him up the totem pole. Guys like him are hard to find. DE Owa Odighizuwa is physically impressive. Great body, bends well, has some power to him but there is lot of hesitation to his game. He doesn’t disengage from blockers and has been routinely getting beat. DT Jay Bromley is a name I haven’t discussed too often, but he had a couple nice plays in team drills. He completely schooled OC Weston Richburg on one play that would have resulted in a sack. DT Robert Thomas ended up at Eli Manning’s knee/foot area during live drills, not good. They don’t need to be seeing that. LB B.J. Goodson is playing fast, especially evident when he is pursuing to the sidelines and covering laterally. FS Darian Thompson came down with an easy INT on an overthrow from Manning to RB Orleans Darkwa, but right place/right time is the name of the game for those guys. I don’t want to rank these guys or project final depth chart until the end of the month, but the safeties are really being given opportunities. I think it is completely open behind the starters + Andrew Adams. Eric Pinkins continues to stand out and rookie UDFA Trey Robinson came out of nowhere a couple times to make a play. S Landon Collins: Fast. Big. Strong. Powerful. This guy is putting everything on display and when he’s not on the field, he is in the coaches ear. Very into practice. His instincts have been jumping out at me. He is in the right place before the right time almost always. TE Evan Engram: If Sterling Shepard is going to miss any time, look for Engram to see an uptick in snaps. He has WR movement and what I’ve noticed more than anything, the ability to adjust to poorly thrown balls. Yes he is a rookie and there is a lot to take in playbook-wise, but he is too talented to keep on the sidelines. He can be a matchup nightmare. WR Travis Rudolph: Again, as Sterling Shepard misses practice you want to see guys step up and take advantage. Rudolph is getting more and more action each day. He isn’t big or physical, but he knows how to make himself slippery to defenders. He may not be the best athlete, but he is so mechanically sound as a route runner and he sells well. He can run himself open better than I thought and most importantly, he catches EVERYTHING. Below is our video recap and interview with TE Matt LaCosse. Place kicker Aldrick Rosas went 4-for-4 on field goal attempts, including one from 56 yards out. For the second day in a row, there was a lot of pushing and shoving between the offense and defense after the play. In run defense drills, defensive tackle Jay Bromley penetrated into the backfield to tackle the back behind the line of scrimmage. Wide receivers Tavarres King and Kevin Norwood caught deep passes in 7-on-7 drills. King beat defensive back Mykkele Thompson on a pass from quarterback Geno Smith. Defensive back Mykkele Thompson broke up a Geno Smith screen pass. Quarterback Eli Manning threw a touchdown pass to wide receiver Brandon Marshall, despite being well-covered by cornerback Eli Apple. Defensive end Jason Pierre-Paul blew past right tackle Bobby Hart for what would have been a sack. JPP then knocked down a slant pass. Safety Landon Collins put a big hit on running back Paul Perkins after he broke through the line. Collins later broke up a quarterback Eli Manning pass intended for tight end Rhett Ellison. Brett Jones received first-team reps at center. Safety Darian Thompson picked off a pass from quarterback Eli Manning. Quarterback Geno Smith hit wide receiver Kevin Snead deep for a touchdown. Safety Nat Berhe picked off a tipped pass from quarterback Josh Johnson. Linebacker/tight end Mark Herzlich made a diving catch on a pass from quarterback Davis Webb. Safety Trey Robinson picked off a quarterback Davis Webb pass intended for wide receiver Kevin Snead. Tight end Jerell Adams dropped a pass from quarterback Davis Webb. The seventh training camp practice will be held on Friday, starting at 11:55AM. The training camp schedule is available at Giants.com. 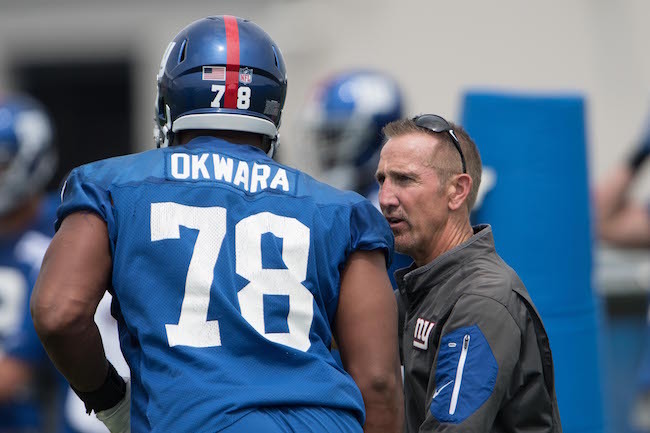 The New York Giants held their fifth summer training camp practice on Wednesday at Quest Diagnostics Training Center in East Rutherford, New Jersey. Running back Shane Vereen (lower body soreness), defensive end Jason Pierre-Paul (rest day), defensive end Devin Taylor (lower body soreness), and cornerback Valentino Blake (lower back tightness) did not practice. Wide receiver Sterling Shepard (rolled ankle) was carted off the field with what originally appeared to be a serious injury. Reporters tweeted that Shepard was in obvious pain. The NFL Network is reporting that initial test results say the injury is a low-ankle sprain. Offensive lineman Jessamen Dunker (foot) was also carted off of the field. First off, apologies we didn’t have time to do an interview today. I had to jet out of there at 12:40 today. We were there for the majority of practice, when they moved the team inside the facility we opted to leave, as the meat of the action was over. Saw Mike Nugent get the kicks today, don’t read into depth chart stuff there. These guys aren’t going to kick a lot of volume at this point, they may even flip-flop each day. This will be a battle that goes to the end. Rosas’ leg is stronger. Was looking at the OL as much as possible today. Ereck Flowers still struggles with his pad level. Defenders are constantly getting underneath him, causing him to lean over and bend at the waist, making his hand placement sub-par. More of the same there but he did have a couple of run blocks where his natural power and strength were on full display. That’s one thing he always has, strong punches and ability to anchor. Right guard anyone? LG Justin Pugh got in to a couple fights today. He looks to be the enforcer of this offense; he doesn’t want any of his guy taking extra hits and showed no hesitation in defending them when they did. I wanted to get more looks at UDFA Jessamen Dunker. Early in practice, Dunker impressed me with both straight line and lateral movement. Definitely a plus athlete who can be where he needs to be at the right time. But body wise, he is a year away. He will be one of my practice squad predictions but he did get hurt today; we’ll see there. OT Jarron Jones is at the very beginning of a very long road when it comes to his OT progression. He won’t be a factor on the field this season, not even close. Expectedly so, he looks 2-3 steps behind every time he is out there in live action. My question is, will they use a practice squad spot on him? He will have to show a consistent work ethic and approach if he has any shot. Was rough to see WR Sterling Shepard go down. I saw the whole process and at first I thought it was an Achilles, he was visibly upset and in pain. A sprained ankle can linger for months and in some cases can be worse than a fracture. Now it’s a waiting and hoping game. Who is going to step up in his place? Tavarres King was with the first three WR set. He is the best short area mover of the rest. Quality route runner, can be slippery after the catch. Roger Lewis may have more raw talent but he’s still towards the beginning of his WR maturation process. I see the team trying to get more and more looks at Darius Powe. Physical pass catcher with some ability after the catch. They like the dependability of Dwayne Harris. Could this open a door for the fastest guy on the team, Kevin Snead? TEs Matt LaCosse and Jerell Adams caught passes on the all-out move today, a welcoming sign for a team that didn’t get enough from that position in 2016. Hard to ignore the every-down upside of Adams. This LB core looks angry. All of them. While the group fights may be a little over the top and the coaches supposedly don’t like them, part of me likes the fact these LBs are starting them. They are hitting a little too hard but they are doing it on purpose. It’s a personality trait to a defense that you want. B.J. Goodson, Devon Kennard, and Jonathan Casillas especially were instigating. This defense is VERY physical. Still a little confused how this team plans on using LB Stansly Maponga. He is very strong and stout. But I don’t see him performing well in space and he can’t play DE in this scheme. I think he is a 3-4 OLB-only type but maybe NYG has a role for that kind of guy more than we think. DT Dalvin Tomlinson got some snaps against first-team linemen. He has great short area burst and closing speed. I think there is some more pass rush potential here than I initially thought. On the flip side, he got handled by D.J. Fluker a couple times on running plays. S Eric Pinkins is interesting to me. There is a lot of talk about backup safeties and I have to think this hybrid S/LB, plus athlete is in the mix. He is a superb athlete with good size. Physical kid and he was performing very well in special team drills. I haven’t seen much out of DT Corbin Bryant and with the DL being pretty crowded depth wise, he will need to stand out over the next few days if he is going to make this team. OT Bobby Hart – For the second day in a row, I walked away with a positive impression on Hart. He looks more confident and quick-minded out there. Reacting more so than thinking his way through things. He wins almost all of his physical one on one battles, and his pass protection techniques look like they’ve been cleaned up. DE Romeo Okwara – On a team full of physical specimens, Okwara takes the cake. He is by far the most impressive athlete on this team. He is still a little raw and too straight line dependent when it comes to movement, but the tools are there and if NYG is patient, I think he is going to be a good one. Pad level, post-engagement moves, and consistent leverage are things he needs work on but in time, they are very correctable. I am really excited about him. OG D.J. Fluker – Really good day for this big man. And I mean BIG. He swallows defenders, even makes DT Damon Harrison look small. I’ll say this about Fluker, if he gets his hands on the man he needs to run block, it’s over. He won every battle I watched him on. I think RG is the perfect home for him. Place kicker Mike Nugent was 4-for-4 on field goal attempts, including kicks of 30, 32, 37, and 42 yards. The Giants continue to alternate Josh Johnson and Geno Smith at the #2 quarterback spot. Today Johnson was the #2 quarterback. With wide receiver Sterling Shepard out, Odell Beckham, Jr. and Dwayne Harris were spotted playing in the slot with the first-team with Tavarres King outside. Wide receiver Darius Powe had his second active day in a row catching the football. Cornerback Donte Deayon broke up a deep pass intended for tight end Evan Engram. Quarterback Geno Smith hit wide receiver Travis Rudolph down the right sideline for a big gain. Quarterback Eli Manning hit wide receiver Odell Beckham, Jr. for a touchdown. 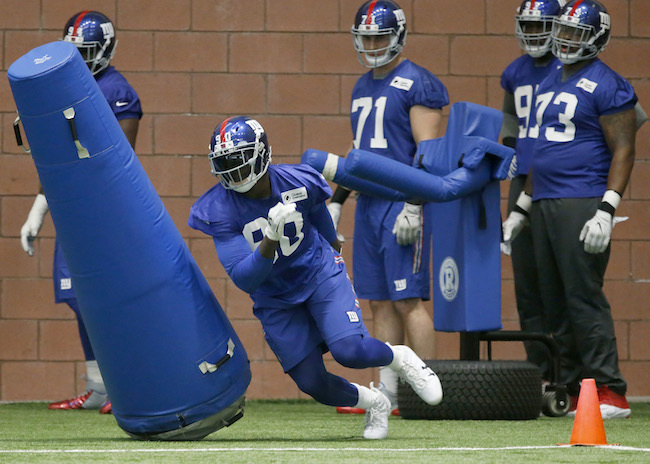 With Jason Pierre-Paul out, Kerry Wynn received some first-team reps at defensive end. 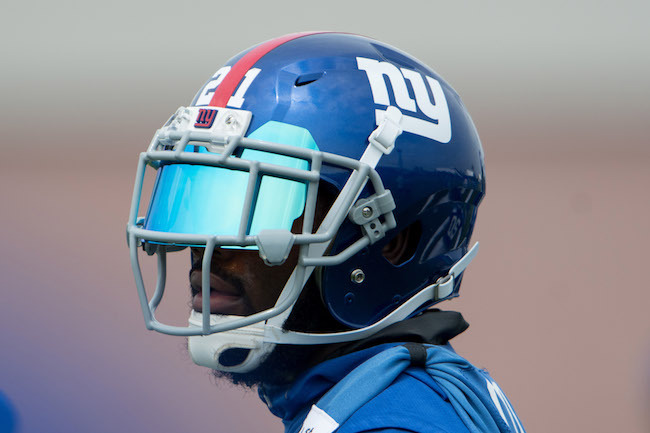 Landon Collins, Darian Thompson, and Nat Berhe were the safeties in one three-safety package. Defensive end Avery Moss continues to flash on the pass rush. Wide receiver Roger Lewis caught a long bomb from quarterback Geno Smith over defensive back Mykkele Thompson. Quarterback Davis Webb hit wide receiver Travis Rudolph for a deep touchdown over cornerback Nigel Tribune and safety Eric Pinkins. The sixth training camp practice will be held on Thursday, starting at 10:55AM. The training camp schedule is available at Giants.com. 2016 YEAR IN REVIEW: For quarterback Eli Manning and the entire passing offense, 2016 was a major disappointment. The passing game was once again expected to be THE strength of the team. Instead, the New York Giants fell from 7th in the NFL in 2015 (271.4 yards per game) to 17th in 2016 (242.4 yards per game). Manning’s yards, yards per pass play, and touchdowns were down while interceptions increased. All of this was a significant shock given that Manning was coming off of one of his best seasons in 2015 and was entering his third season in Ben McAdoo’s West Coast Offense. The Giants had problems making big plays. And when they didn’t hit the big play, the Giants had problems sustaining drives and scoring points. This wasn’t supposed to happen given return of Victor Cruz and the addition of Sterling Shepard, not to mention the rest of the offense returning mostly intact. The back-up quarterback situation also evolved into a mild surprise. Ryan Nassib – who was drafted in the 4th round of the 2013 Draft and who was the #2 quarterback on the team since 2014 – had a terrible preseason and then developed an elbow issue that landed him on Injured Reserve in December 2016. He was replaced by Josh Johnson, who the team signed in September after he was cut by the Baltimore Ravens. ADDITIONS/SUBTRACTIONS: The Giants made no effort to re-sign Ryan Nassib and he has since signed with the New Orleans Saints. The Giants re-signed Josh Johnson, signed ex-New York Jets quarterback Geno Smith in free agency, and drafted Davis Webb in the 3rd round of the 2017 NFL Draft. TRAINING CAMP STORY LINES: It’s one of the great ironies that a two-time Super Bowl MVP quarterback on a team that plays in the biggest media market in the world is rarely the subject of media attention. For years, his pressers have been yawn-fests that rarely make a headline. That’s a tribute to Manning’s demeanor, character, hard work, on-field success, and off-field behavior. That said, the biggest question mark on this possible Super Bowl contender is if Manning is losing it? Manning has never missed a start, but he is 36 years old and coming off a disappointing season where much more was expected. Many will convincingly argue that Manning was sabotaged by a sub-par supporting cast, but if this was true in 2016, it was also true in 2015 as the biggest changes were the moves from Rueben Randle and Dwayne Harris to Victor Cruz and Sterling Sheppard. Perhaps the loss of Shane Vereen was a much bigger blow to the passing game than realized. This offseason, the Giants ditched their 2016 opening-day starters at running back (Rashad Jennings), wide receiver (Victor Cruz), and tight end (Larry Donnell). 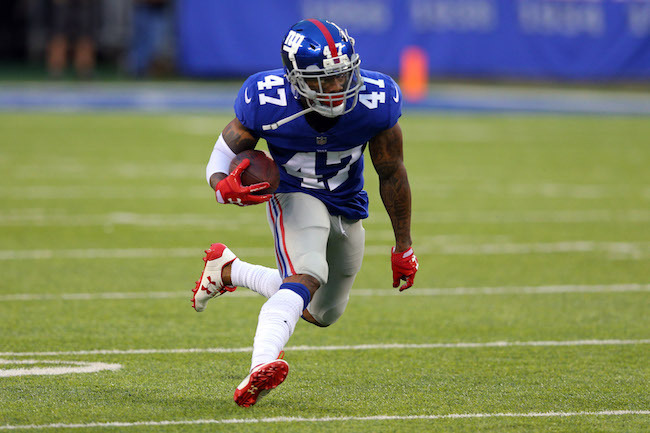 They added aging but still dangerous super-stud wideout Brandon Marshall, revamped the tight end position with the additions of Evan Engram and Rhett Ellison, and re-configured the running back group with Paul Perkins starting and the drafting of Wayne Gallman. In both of Manning’s two Super Bowl seasons, he had a quartet of dependable targets to throw to (Plaxico Burress/Amani Toomer/Steve Smith/Kevin Boss in 2007 and Victor Cruz/Hakeem Nicks/Mario Manningham/Jake Ballard in 2011). The Giants appear to have a similar level of talent now. So the pressure will be on Manning to perform and once again make the Giants a top-10 passing offense. A highly-paid franchise quarterback is supposed to raise the level of the entire offense. The second big story line, and the one actually gaining more media attention right now, is the back-up quarterback situation. Because of when he was drafted, Ryan Nassib was never considered the heir apparent to Eli Manning. But Davis Webb has a legitimate chance to eventually replace arguably the best quarterback in New York Giants history. Webb has the physical tools and he appears to have the mental make-up. But does he have “it”? And can he handle the media spotlight of New York and the pressure that comes with replacing a living legend in a few years? In the short-term, Geno Smith and Josh Johnson will most likely vie for the #2 job. While unlikely, Smith has been given a tremendous opportunity to revive his career and stick it to the Jets if he eventually became a successful starter with the Giants. But don’t count out Josh Johnson, who may be better suited to the back-up role. ON THE BUBBLE: Barring the unforeseen, Eli Manning and Davis Webb are locks to make the 53-man roster. 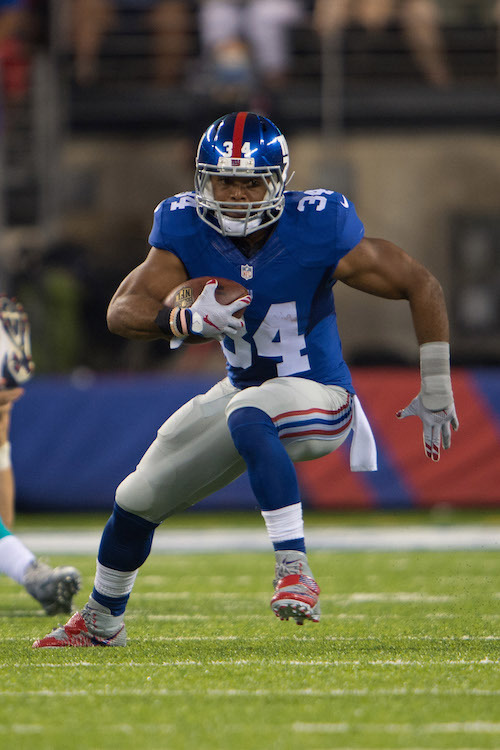 The Giants won’t risk putting Webb on the Practice Squad. Unless Webb unexpectedly advances rapidly, the Giants will carry three quarterbacks and Geno Smith and Josh Johnson will be fighting for the primary back-up spot. PREDICTIONS: Eli Manning seems to alternate the good with the bad. Since 2016 was a down year for him, expect him to rebound in a big way in 2017. Of course, having Odell Beckham, Brandon Marshall, Sterling Sheppard, and Evan Engram to throw to will help his cause. The big question is how good can Eli play at the age of 36? The pressure will be on him to perform and help his team make another Super Bowl run. 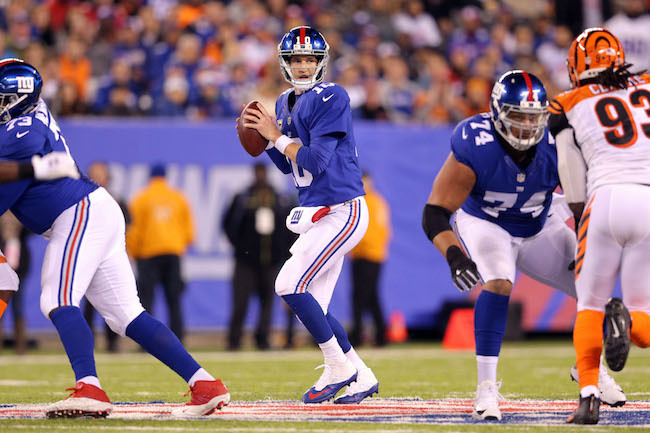 If Eli and the offense struggle, we may see Davis Webb sooner this decade than expected. 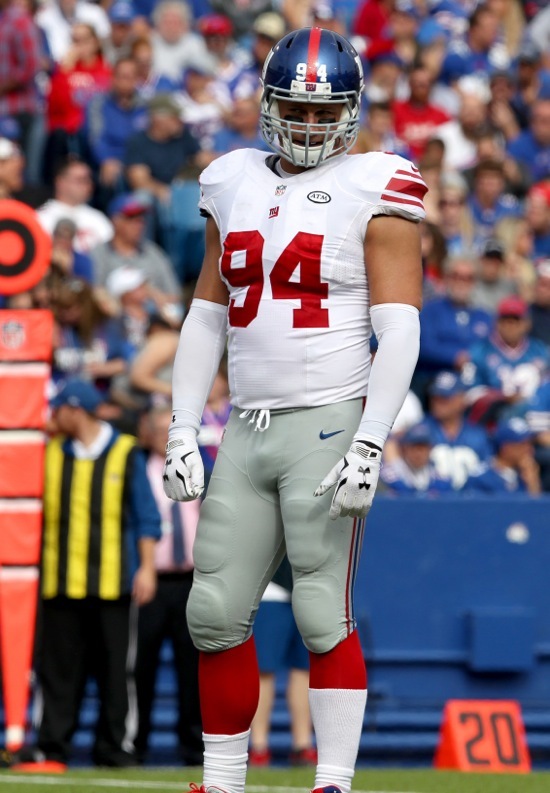 New York Giants linebacker Mark Herzlich has revealed that the reason he changed his jersey number from #94 to #44 was so he could also play tight end on offense. The coaching staff asked Herzlich to also learn the offense this offseason. New York Giants linebacker J.T. Thomas, who missed virtually all of the 2016 NFL season after tearing the ACL in his left knee in the regular-season opener against the Dallas Cowboys, is still recovering from the injury. Thomas was originally drafted in the 6th round of the 2011 NFL Draft by the Chicago Bears. The Bears waived him in August 2013 and he was claimed off of waivers by the Jacksonville Jaguars. The Giants signed Thomas in March 2015. In 2015 with the Giants, Thomas played in 12 games with 11 starts, missing four games with an ankle injury. Thomas currently has the team’s 10th largest 2017 cap hit with $4 million. Darian Thompson (foot) said he's "pretty close" to going full-speed. He's waiting for green light from staff. "We have plenty of time."